In a BYOD (Bring Your Own Device) or BYOT (Bring Your Own Tech) scenario, the user provides their own devices which are then on-boarded to the school’s existing network infrastructure. In a 1:1 scenario, the school provides devices to students for their use, and sets the limits of where the users can take the devices, i.e., for home use. 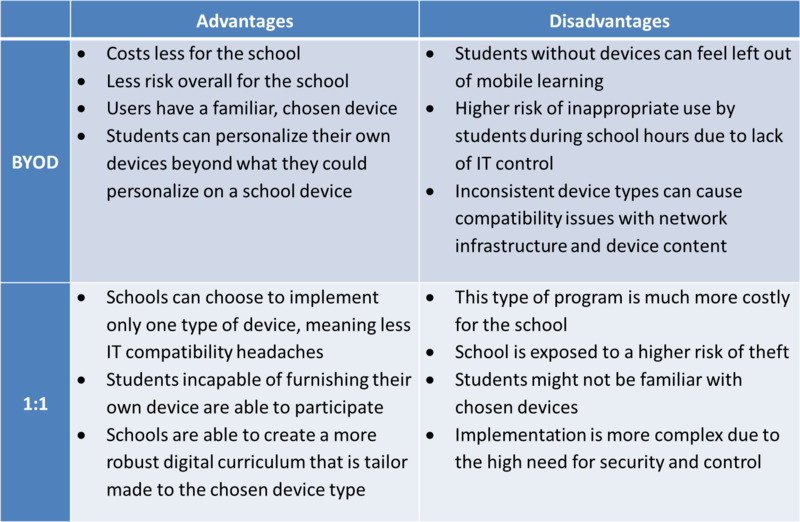 Generally speaking, these are the two paths available to schools looking to add mobile learning devices to their curriculum. There are numerous advantages and disadvantages inherent in each type of program. Even though these two educators have drawn totally different conclusions about very similar situations, neither of them is wrong. The reality is that there is no “right” way to implement mobile learning – the best solution will always be the one that fits the realities and the objectives of the school or district in question. Read more educators’ opinions about BYOD and 1:1 in this article from Tech & Learning, which is a great resource for learning about technology in education. Check out their list of 10 Tips for 1:1 or BYOD and help your customers make the best possible choices when implementing mobile learning.